Our latest episode, Episode 8 - Cabbages and Tomatoes, is up and ready for your listening quasi-pleasure. In it, we look at Roberto Alagna and his crazy antics. I'd like to thank our new member, Greg Peebles, for joining us. He runs a blog that is a great resource for information, entertainment and general craziness...it's called Counter/Point 3.0...check it out. Also, regular panelist Oliver Camacho has a performance coming up in late January featuring his new endeavor, The Opera Company (what a novel name! ), that will take at place at the Chicago Cultural Center. We'll give you more information as it comes in. I'd also like to apologize for the hacking that went on (on my part) during the course of the show. I was under the weather, but couldn't resist going on with the show. 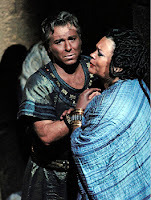 And now one final nail in the Alagna coffin...This is a picture from what appears to be the recent Aida production that so many have heard of (though it must be from the opening night since he left the stage on the (in? )famous night long before this scene would have happened)...is he in black face, or is she just blocking his light? Anyone??????? Bueller? We did a show last night that tried to take apart the whole Alagna debacle...I thought that it went pretty well, but you all can decide for yourselves. Could this sound the death knell for Roberto? Will this be a warning to all who would try to place themselves above the art form itself? Will Batman and Robin escape from The Penguin’s dastardly devilish death ray? 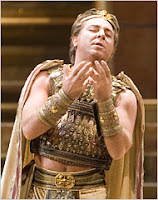 There's been a lot of press over the past few days concerning Roberto Alagna and his "take this job and shove it" stunt at La Scala in a production of Aida. Apparently he was booed by the so called "loggionisti" (it would seem the Italian equivalent of the standing room opera die-hards at the Met) when he began his first aria (Celeste Aida for you novices). He gave the audience a salute, and promptly walked off the stage right in the middle of the music. They had to throw his cover on in his street clothes to keep the scene going. We'll be discussing this in more depth on tomorrow's show, but I would like to go on the record that I love the idea. The whole truth of the matter will probably come out over the next few days, but the idea of someone just walking off in the face of booes right in the middle of an aria is pretty appealing to me. But then I may be different than most. One of my most treasured performing experiences was when a second show I was in was canceled because nobody showed up to watch! Man was that great! Note...After I wrote all this during the afternoon, I found the clip from the performance...judge for yourself! I've come to the realization that if I want this dumb show to succeed, then I need to really keep on top things. The actual production of the show...the recording, the editing, etc. has really taken up most of my time. Initially I didn't even really have a "home" for the show. I would just tell people to get us from iTunes or from the cheap page the my hosting server gave me (no offense...Switchpod is great...and for now, it's FREE). I'm sure I'm not using this blog format correctly as a way to host a podcast, but at the very least I need to keep the postings up-to-date. That will be my goal from now on. I'll try to get some kind of drivel up here every day. Sometimes it may be a pearl or two of wisdom...most of the time it will be pearls before swine...but at least it will keep me connected to you, my dear listeners. I say listeners because the show for me is the thing (wherein I'll catch the conscience...whatever) that is what I'm all about. As a note, I want people out there that are or are not listening to the show that the term podcast can be a bit misleading. I (and many other "podcasters") have been told that they would like to listen, "but they don't have an iPod." 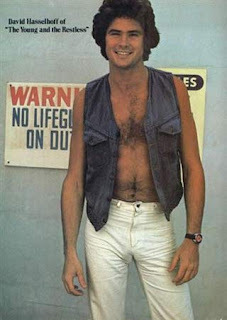 I'm here to tell you that you don't need an iPod to listen. With this blog set up the way it is, you can listen right here...just click on the show link and your default audio player should open up. Some proponents of this form of media have wondered if it might be a good idea to change the term podcast to something else..."netcast" has been bandied about, as well as my own, "show you listen to on a computer or portable audio device." Whatever you call it, you can listen to it anywhere!!!! Show note...I think that the episode I've been mentioning for some time now...our look at new opera...is FINALLY going to happen...look for it some time next week! Episode 7 - Why Can't the Americans? Episode 6 - Nothin' But Muppets! Episode 5 - Prisoners of Love...and Happy Thanksgiving, Americans! This week's show is a heartwarming look at the redemptive power of opera in the prison system...in my opinion, a much better alternative to being shivved in the shower (well, at least BETTER if not much better). Sorry about all the crap that went down, but what can you do??? For some reason the show is not showing up in iTunes. As I mentioned yesterday I've done some back-end changes and as a result, things seem to have gotten screwed up!